I finally figured it out everyone. I figured out something really important on Sunday morning as I was getting ready for church. Actually, it came more like a revelation, as it was something that I never really pondered before. Is there anything that God doesn’t know? Well, I found out there is one thing that God doesn’t know–something He can’t do. 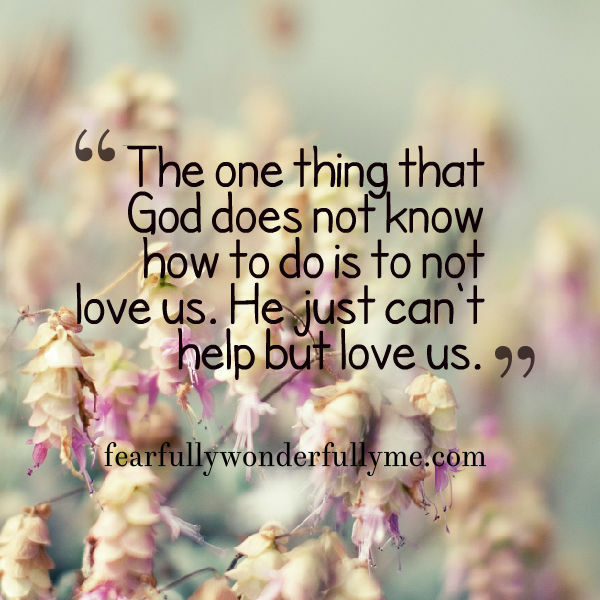 The one thing that God does not know how to do is to not love us. He just can’t help but love us. No matter how much we fail or screw things up, He still loves us. No matter how great our sin, His love is greater. Even though the wage for man’s wicked ways is death, God decided to pay that for us through His only son Jesus. God just can’t follow the status quo. I love how my Lord and Savior is a rebel. I love how he can’t hate me, even when I rebel against Him and do things my way. He still calls me back to love me tenderly in His arms. God still can’t resist loving me and showering me with grace and mercy. Sure, He may correct me and push me to turn my behavior around, but like any good parent He does so lovingly. So here’s to you God. I’m so glad that you don’t know any other way but to love your children. If any of you don’t know the love of God, then I invite you to start reading your Bible and pray to Him. Go to a welcoming church. Seek God with your whole heart and you will find Him (Jeremiah 29:13). Happy Labor Day everyone! I hope you remember to take a moment from your plans and just give thanks to the Lord for all of His love. We love him, because he first loved us (1 John 4:19 KJV). Right now there are thousands of men, women, and children who are lost without food or water. You might have heard of the migrant crisis in Europe, but maybe you’re asking how you can help? Pray for these lost souls that they will find shelter and welcoming arms. Pray that God will move people’s hearts and create hope. Visit some websites like Save the Children and the Red Cross if you are able to donate. Spread the word! Next to prayer, this might be the most important thing to do. The more people are educated, the more they can help! First of all, I enjoyed this post. Secondly, I feel a bit ignorant, but I want to know what caused this migrant crisis that you refer to. Kindly fill me in. God bless.